Bring your golf clubs on this North Myrtle Beach vacation, because not only are there about 100 terrific golf courses from which you can choose to play, there is a sparkling blue swimming pool at this North Myrtle Beach resort in which you can take a refreshing dip after playing 18 holes. The spacious two-bedroom, two-bath North Myrtle Beach vacation condominiums at Summer Times are full of comfortable furnishings and convenient amenities. Beautifully landscaped with a lush lawn and shrubbery that affords Summer Times much privacy, this North Myrtle Beach vacation property is simply gorgeous and features many areas in which you can relax in peace and quiet. North Myrtle Beach, SC offers terrific weather while Summer Times gives you a fabulous North Myrtle Beach vacation lifestyle. 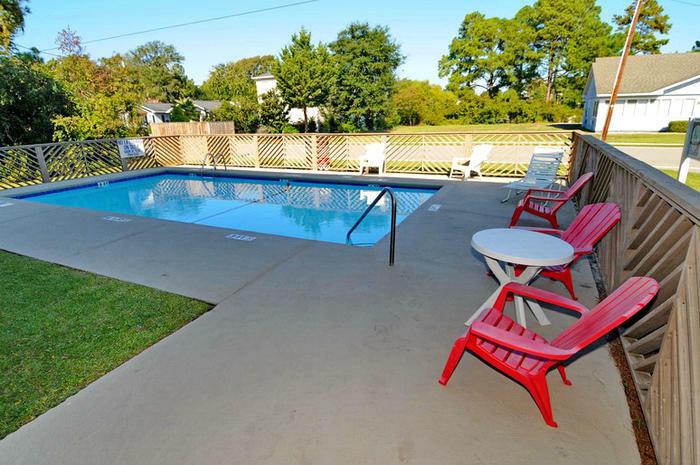 From the sparkling blue swimming pool of this North Myrtle Beach resort to the Atlantic Ocean that is just a couple blocks away, you will enjoy your own piece of North Myrtle Beach paradise on this property. The furnished balcony is terrific for enjoying a morning cup of coffee or an evening cocktail. From here you can plan your North Myrtle Beach agenda so you do not miss any amusement or attraction that you want to see. Within minutes your family can be at a waterfront shopping destination, like Barefoot Landing, where award-winning restaurants mingle with quaint shops and theatres along the Intracoastal Waterway. Water parks with thrilling slides and flumes are nearby and beach clubs with shag dancing are just down the street. When your family enjoys nice accommodations at Summer Times North Myrtle Beach resort, rest assured that you are only a short walk from the white, sandy beaches of North Myrtle Beach where you can swim all day in the rolling waves, bask in the North Myrtle Beach sun for a golden tan and take long walks on the moonlit beach. Marinas, piers, ice cream shops, putt-putt golf, beachwear stores and boat rentals are all close to Summer Times North Myrtle Beach resort. Explore the area, discover a must-have souvenir and capture memories during your next North Myrtle Beach vacation that includes a stay at the comfortable Summer Times North Myrtle Beach vacation rentals. Elliott Beach Rentals is not affiliated with onsite management or the HOA of Summer Times.